I have a pretty active Twitter. Maintaining it isn’t easy–to tweet at the rate that I do (around 10-12 per day, not including favorites or retweets), I’m sharing a ton of content. And it’s paid off. I’m on a ton of lists and I have twice as many followers as I am following. What if I told you that I only spend 15 minutes on Twitter a day? How do I get away with that? I’m a big fan of automation nation, so I took the time to figure out the best Twitter tools to increase followers in 2015, to always have new content filtering through my feed, and to encourage engagement. 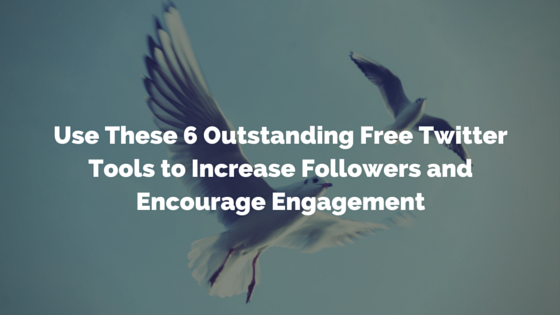 Check out these free 6 Twitter tools to increase your following! Crowdfire will give you a complete picture of who’s following you, who’s unfollowing you, and who’s inactive. It has a cool feature to copy other Tweeps’ followers so you don’t have to do a whole lot of analysis of who you should follow–they’ve already don’t it for you. For example, I’m a big fan of Neil Patel, author of Quicksprout. He has 164K followers who are interested in content writing, SEO, and online marketing–in other words, his audience is exactly who I want to attract to my site. The first thing I want to do is check that his followers weren’t bought (no one wants to accidentally follow a bunch of worthless bots). I hop over to TwitterAudit and plug in his user name. Sweet. Looks like most of his followers are real. 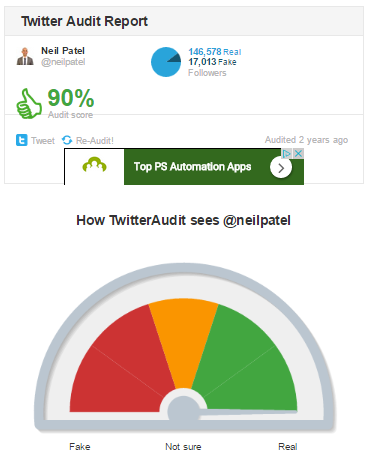 So I head on back to Crowdfire and plug Neil’s Twitter handle into their “CopyFollowers” tool. It then generates who’s following Neil into a long list of recommendations. Unfortunately, Neil has so many followers that I had to scroll until I found just the right lady to follow. 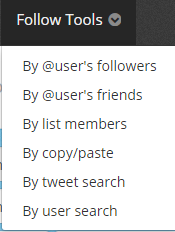 Luckily there are other tools that can help narrow usernames’ followers, but we’ll get to that in a bit. How Crowdfire really helps me is that it allows me to automatically send direct messages to new followers. From there, I put in my latest post. Voila! Every time I get a new follower, they head on over to my site! Crowdfire is great and all, but how do I actually get people to follow me? The follow/unfollow method has been used for quite some time now, and it continues to be the most effective way to garner Twitter followers. Luckily, Tweepi makes it easy. When I sign into Tweepi, it immediately gives me an overview of how many followers I have and whether or not I’m following them back. The first thing I do is head over to the users not following me back. I filter them out using Tweepi’s narrowing tools at the top of the page. I then quickly click through to unfollow these pesky Tweeps–they probably won’t follow me back at any point in the near future. I cap at 100 unfollows over the course of a day. Let’s use Neil Patel’s followers again. I’m going to use some new filters–a whole lot of them. First, I make sure that the people I’m going to be following will have tweeted in the last day and make sure that they’re likely to follow me back with a (relatively) low follow ratio. I then filter further to cut out spam. You’ll notice, at the bottom, that Tweepi says that it only filtered out 4 users. That’s per page–the annoying thing about Tweepi is that you have to go through each page to see which users are filtered out per 20 or 40-user batch. But it’s well-worth it. I’ve increased my Twitter following 20% over the course of 10 days using just this strategy in the past, and you can too. 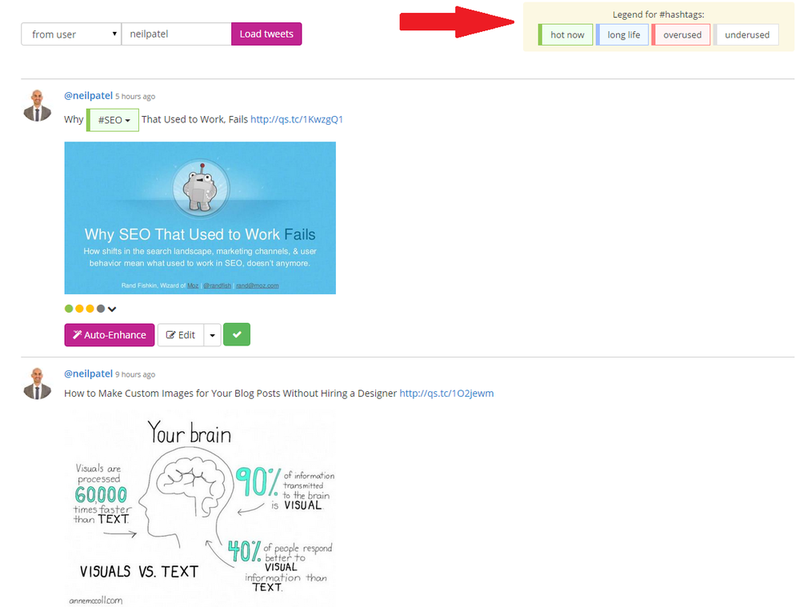 I mentioned this fantastic tool in my last blog post as an outstanding free content curation tool. DrumUp is great for finding new content to schedule for your Twitter feed, as it lists new articles pertaining to your interests. First, connect to your Twitter and head on over to settings to make sure that you plug in keywords that are relevant to you. I then recommend setting DrumUp to schedule 3-5 tweets a day. DrumUp does the rest for you: it scrounges the web for headlines that directly relate to the keywords that you plugged in. It will automatically generate tweets that are no more than the headline and the URL for the article that it’s recommending. From there, I take the time to click through articles that I think that my Twitter audience will enjoy, and tweak them to my liking. Taking the screenshots took longer than customizing it. I use this tool to generate content a week in advance for my Twitter feed. 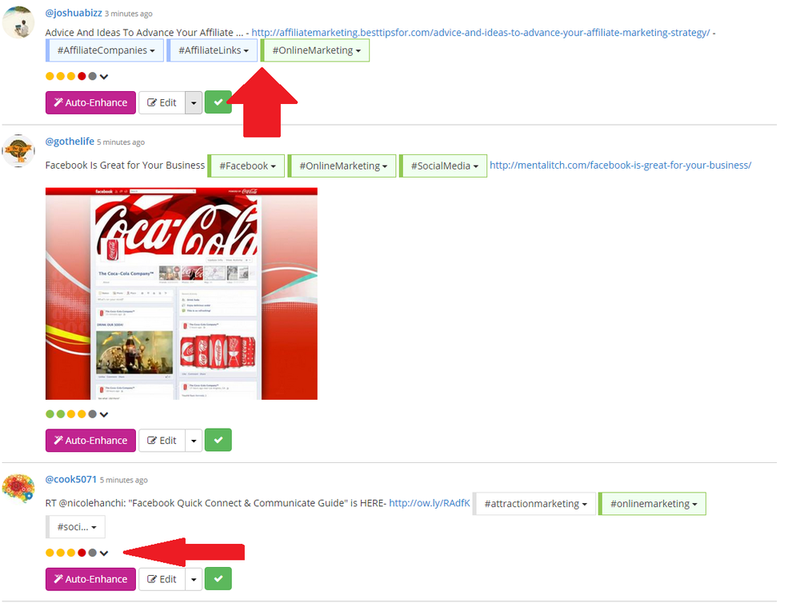 Heck, I know I’m not “supposed” to automate tweets, but this is about engagement, right? They can always be deleted in the case of a national crisis. 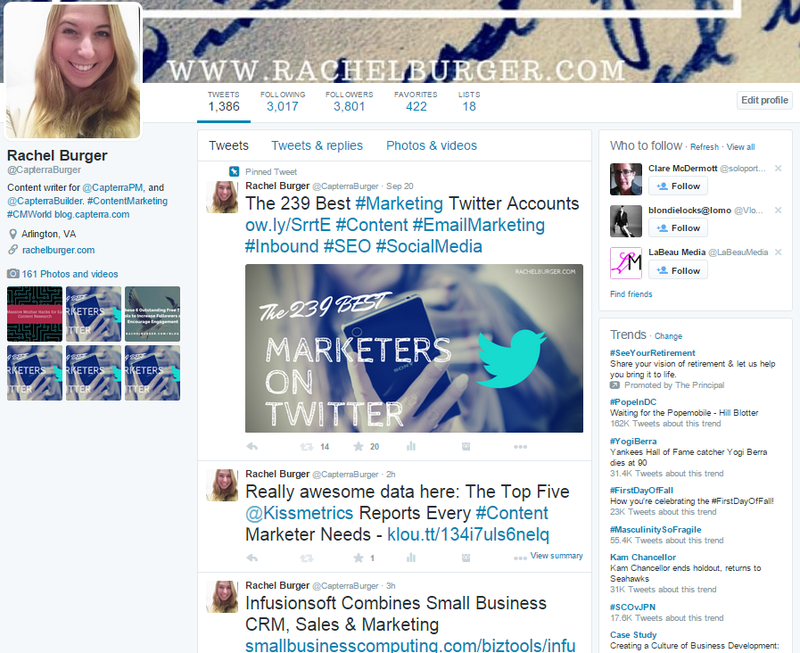 As a content marketer for Capterra, I rely a whole lot on Hootsuite to make sure that I’m promoting my content the right way. Mostly I rely on Hootlet, a little Hootsuite Chrome extension, to schedule articles that I find relevant to my Twitter audience. First, I pull up my latest article, my last article, and then a mish-mash of articles I plan to promote for the week. 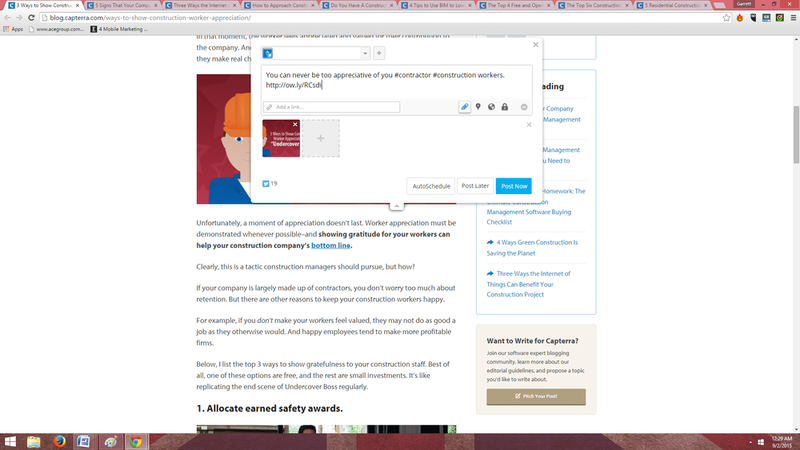 Let’s take Capterra’s construction management blog as an example. I pull up nine posts and hit the Hootlet button. Notice how the blog post has an eye-catching graphic? I’d like to embed that in the tweet, so all I do is upload it as an attachment using the little icon on the right-hand side. I customize the tweet, set it to Autoschedule, and then… do it again. With the same post. I rework the tweet so that the post goes out once an hour on the post’s first workday of release, and then once for the rest of the week. 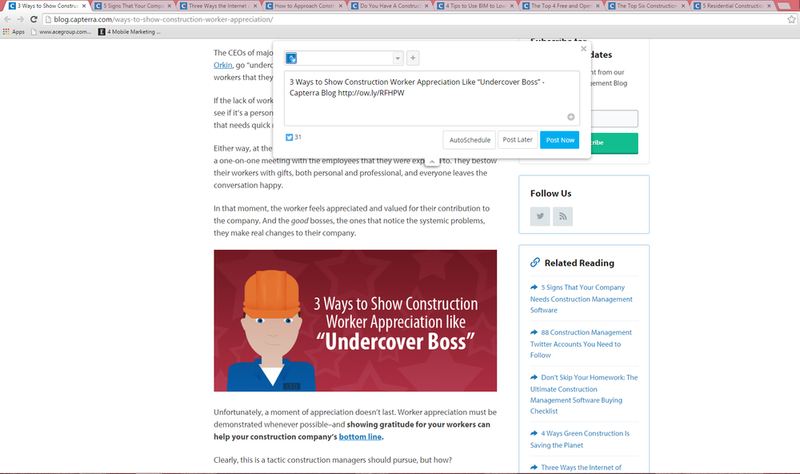 I pull up last week’s post to promote it again, and then intersperse other Capterra content. 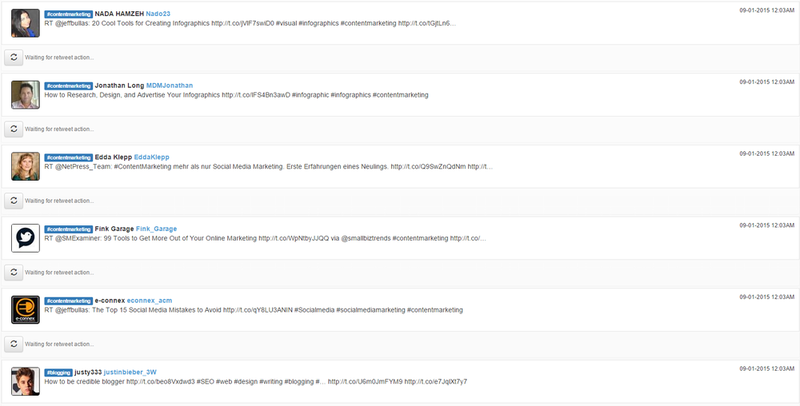 Now, because I’m using DrumUp and Hootsuite, I’m able to churn out a nice amount of engaging, interesting content all with these free Twitter tools. But wait! Of course there’s more. I’m not done scheduling out content. 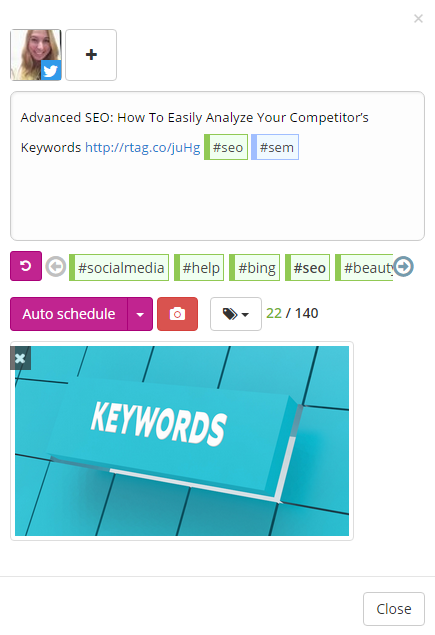 RiteTag may be the absolute coolest free Twitter tool, because it requires so little effort from its user. Basically what it does is take tweets that have already been tweeted by other people, and improves upon them. Let me show you what I mean with my favorite content marketer again, Neil Patel. I plug Neil’s Twitter username into the search and RiteTag generates a list of his feed as it appears on Twitter. You’ll notice, as made painfully obvious by the giant red arrow on the screen, that RiteTag rates the hashtags that the Twitter user is relying on. The key is far more apparent when searching using hashtags. Here, I used the term “#onlinemarketing” from the same dropdown as I entered Neil Patel’s screenname. 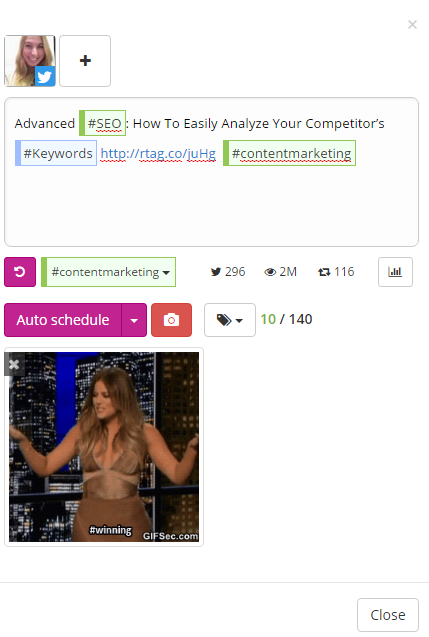 I largely use this tool to create rich content that comes straight from influencers… and then hopefully make their promotion of the tweet just a little bit better. As you likely know, Twitter isn’t just about curating content or promoting the content you’ve been working on–you also should be promoting other peoples’ stuff. Searching through hashtags, retweeting, and interacting with Twitter users in your niche is a great way to get noticed, but who has time to filter through all the 6K+ tweets a second? Enter free Twitter tool TwitterFav, designed to do just that. Connect your Twitter account and head on over to the Favorite or Retweet List under your account profile. Let the system update (sometimes it can take as long as a half hour). From there, you should see a nice list of Twitter users tweeting about topics relevant to the things you care about. From there, its just clicking a button. Favorite and retweet away m’dears! …you’re consistent. Take time in the morning to login to your apps, make sure that your tweets are set for the week or the day, and to interact with your Twitter followers. Free Twitter tools can help you drive Twitter followers and engagement, but, unless you’re looking to buy bots as followers, it’s up to you to keep the momentum going. I would love to hear your comments about how to drive Twitter engagement, what tools you use, and any experiences with the free tools above. What did I get right? More importantly, what did I miss? I look forward to hearing your thoughts! Thanks Rachel – I thought I knew most tools available – some of these are just great. Many thanks. Hey people, thank you for the article. Very interesting read, I’ll be sure to share it with my colleagues. Have you ever used tools such as http://www.tweetfavy.com/ before? It helped me out so much in getting more followers on my Twitter profile. Great stuff, you should check it out! Thanks for the kind words about RiteTag, Rachel! Actually, for $49/year you can do a lot more, including saving hashtags you’ve researched in TagSets, to use again and again. But we’re giving away even more for free: the new app for iOS and Android is available in the app stores – just search RiteTag and enjoy! Check out other RiteKit products as well, especially RiteForge, our consummate social media crafting and publishing suite.